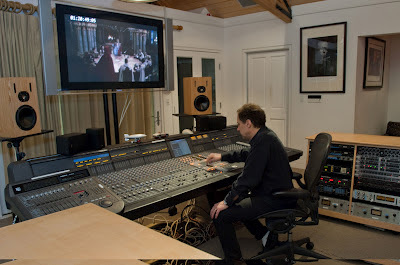 Composer Mark Isham, pictured in his home workspace, outfitted with the help of GC Pro. WESTLAKE VILLAGE, CA, July 12, 2012 — Award-winning composer Mark Isham has an impressive list of credits: scores for such films as Crash, A River Runs Through It, The Black Dahlia, Blade and dozens more, as well as TV shows such as Chicago Hope; a number of GRAMMY®-winning solo albums; and a number of other highly regarded collaborative projects. Recently, his focus has been on composing the music for the hit ABC television series Once Upon a Time, a unique recasting of fairy tale conventions in a semi-modern setting. As he composes at his home studio for this project and others, he again and again turns to Guitar Center Professional (GC Pro), the outside sales division of Guitar Center that focuses on the needs of professional users, to source gear and provide ongoing service and support. The home workspace of composer Mark Isham, outfitted with the help of GC Pro. For each episode of Once Upon a Time, Isham composes in Apple Logic, adapting his established character themes and creating new ones when necessary, and records in Avid Pro Tools. A demo then gets sent to his producer and the show’s creators, who send their comments. Once the material has been approved, the show goes into production, and an orchestrator generates the full scores from Isham’s themes. As one might expect, the layout and components of Isham’s main writing room have been fine-tuned over the years to be perfectly conducive to creativity and productivity. A Logic/Pro Tools setup faces one wall, and a mixing console faces the opposite wall. He has multiple sets of monitors for a TV-type setup as well as a fuller theater setting. The mixing room features an Avid-Euphonix console, accompanied by a 10-way speaker system with Class A amps. He uses M-Audio digital audio and MIDI solutions, plug-ins from Universal Audio and Tannoy monitors, among other gear. Founded in 2001, Guitar Center Professional is the outside sales division of Guitar Center that focuses on the needs of professional users. Its clientele includes recording studios, audio engineers, producers, recording and touring musicians, live sound venues, post production facilities and more. Emphasizing extraordinary individualized service via local account managers, GC Pro offers expert consultation and a comprehensive selection of the world’s finest equipment for music and audio professionals. More information on GC Pro can be found by visiting www.gcpro.com. Guitar Center Professional (GC Pro) is the outside sales division of Guitar Center that focuses on the needs of professional users. Its clientele includes recording studios, audio engineers, producers, recording and touring musicians, live sound venues, post production facilities and more. Emphasizing extraordinary individualized service via local account managers, GC Pro offers expert consultation and a comprehensive selection of the world’s finest equipment for music and audio professionals. More information on GC Pro can be found by visiting gcpro.com. ©2014 GC Pro/Guitar Center. Simple theme. Powered by Blogger.